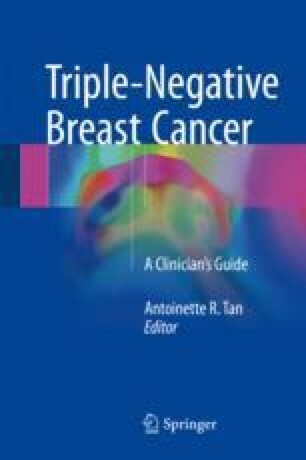 Triple-negative breast cancer (TNBC) is a unique breast cancer subtype with a basal-like gene expression profile and high histologic grade. Compared to the other molecular subtypes of breast cancer, TNBC is seen more often in younger women with dense breast tissue. Thus, TNBC is less likely to be detected with routine mammographic screening. Parallel to having a typical demographic pattern and clinical presentation, imaging findings in TNBC are also characteristic. Some TNBC may present with benign features on mammography and ultrasound, which may result in a delay in diagnosis of this aggressive tumor subtype. In this chapter, we summarize frequently seen imaging features of TNBC on mammography, ultrasound, breast magnetic resonance imaging (MRI), and positron emission mammography (PEM). We emphasize the appropriate role of each modality in detecting, characterizing, and staging TNBC, in monitoring the response to neoadjuvant chemotherapy (NAC), and their potential role in the long-term follow-up of these patients.